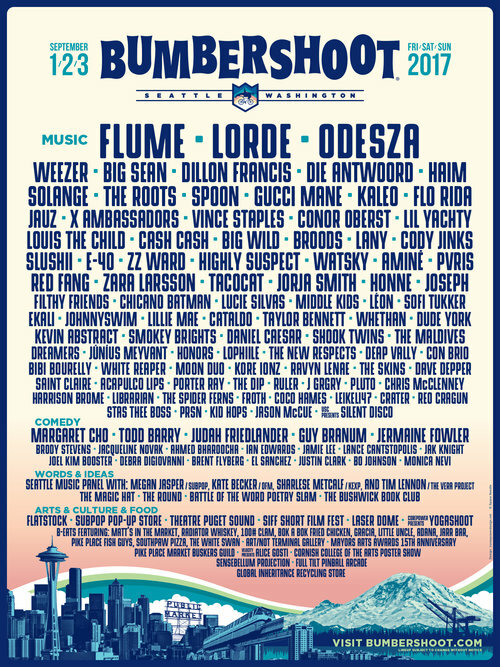 Bumbershoot, Seattle’s Music and Arts Festival, is proud to announce its official 2017 lineup. 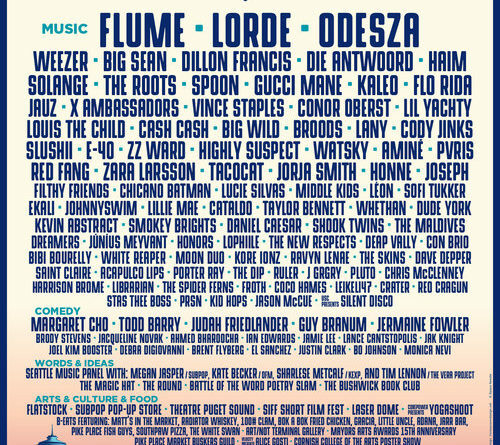 Taking place over Labor Day weekend, Friday Sept. 1 through Sunday Sept. 3, the 47th annual Bumbershoot will feature an eclectic list of performers including headliners Flume, Lorde, and Seattle natives ODESZA, among others. More than 100 additional artists will perform throughout the weekend on more than a dozen indoor and outdoor stages spread throughout the 74-acre festival grounds, which includes both Memorial Stadium and KeyArena. Flatstock, Sub Pop Pop-Up Store, Theatre Puget Sound, SIFF Short Film Fest, Laser Dome @ Pacific Science Center, Corepower presents Yogashoot, Art/Not Terminal Gallery, Mayor Arts Awards 15th Anniversary, Pike Place Market Buskers Guild, Velocity presents Alice Gosti, Cornish College of the Arts Poster Show, Sensebellum Projection, Full Tilt Pinball Arcade, Global Inheritance Recycling Store. One of Seattle’s most renowned restaurateurs, Dan Bugge (Matt’s In The Market, Radiator Whiskey, The White Swan, and 100# Clam) returns this year with an even bigger hand-picked selection of Seattle’s best food. Don’t miss out on some of Seattle’s finest culinary offerings like Matt’s In The Market, Radiator Whisky, The White Swan, 100# Clam, Bok A Bok Fried Chicken & Biscuits, Gracia, Little Uncle, Adana, Jarr Bar, Pike Place Fish Guys, and Southpaw Pizza. Passes for Bumbershoot go on sale Friday, April 28 at 10 a.m. PST. Now approaching half a century, Bumbershoot is one of Seattle’s largest cultural touchstones. Each year, thousands of people from across the country flock to Seattle to attend this acclaimed festival, which has become one of the biggest and most-loved contemporary festivals in North America, while having maintained its Northwest spirit and innovative roots. The name Bumbershoot was chosen both as a knowing nod of respect to our city’s most famous weather pattern, and a symbol of the overarching mission of this festival: to be an umbrella for all of the arts. Since 1972, Bumbershoot has been a multi-disciplinary arts festival showcasing the best of music, comedy, dance, film, literary arts, performing arts, theatre, visual arts and more. Spanning the Seattle Center grounds, a campus originally created for the 1962 World’s Fair, Bumbershoot has continued its legacy of celebrating innovation and the search for what’s next. The programming at Bumbershoot strives to be a contemporary microcosm of what is current across all disciplines and genres within those art forms, giving our audience opportunities few other festivals in the world offer. Founded in 1972, One Reel is a non-profit multi-disciplinary arts organization striving to inspire audiences to become year round arts patrons; challenging artists to create & explore; and training the next generation of arts & events industry professionals. Current One Reel projects include City of Music Career Day, Mayors Arts Awards and Pianos in the Park. For more information, visit onereel.org. AEG Presents Pacific Northwest owns and operates the Showbox and Showbox Sodo venues in Seattle and produces the Marymoor Park Concert Series at Marymoor Park in Redmond, WA each summer. Recent AEG productions in the Northwest include Paul McCartney, Pearl Jam, Adele, Macklemore and Ryan Lewis, and the Foo Fighters. The office produces a diverse array of one-off club to arena level concerts and events annually in Washington, Oregon, Idaho, Montana and British Columbia and supports the AEG Presents touring divisions. Visit Showbox Presents for more information.